This is an easy slow cooker beef stew made with tomato soup. The stewing beef is combined with tomato soup, potatoes, and carrots, along with seasonings. Feel free to vary the ingredients with the vegetables you have on hand. Add onions and root vegetables with the beef, but wait until about 20 to 30 minutes before it's done to add any frozen vegetables to prevent overcooking. I recommend round white potatoes or red-skinned potatoes for stews. Starchier baking potatoes tend to break down over the long, slow cooking time. Combine the stew beef, tomato soup, tomato paste, water, Gravy Master, potatoes, carrots, onion, seasoned salt, and pepper in the slow cooker. Cover and cook on LOW for about 8 to 10 hours. Add the peas in the last 30 minutes. Add any frozen vegetables or canned (drained) vegetables during the last 20 to 30 minutes. Cut up a lean chuck arm or rump roast for this stew. 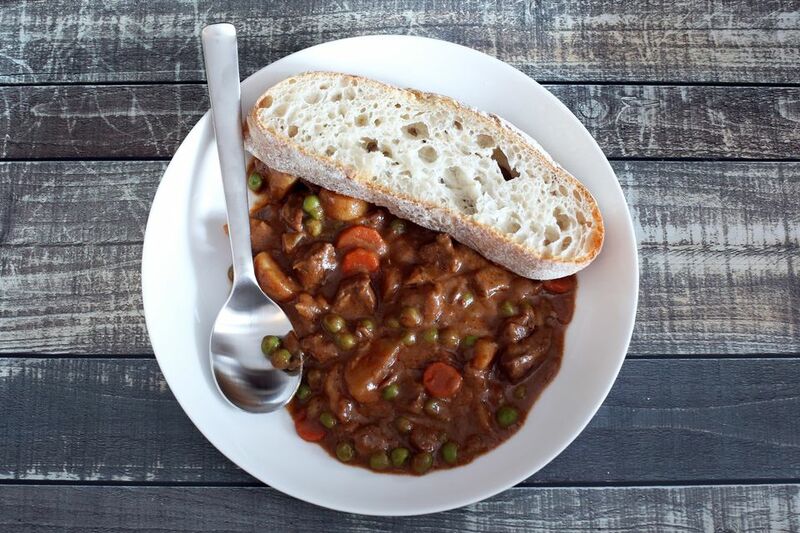 If your stew is too thin, whisk 1 tablespoon of cornstarch with 1 tablespoon of water. Stir into the stew 20 to 30 minutes before it's done. Any hot, fresh out of the over rolls go great with this stew. Instead of tomato soup, use cream of mushroom or golden mushroom and add an 8-ounce can of tomato sauce. Reduce the water to 1/4 cup.